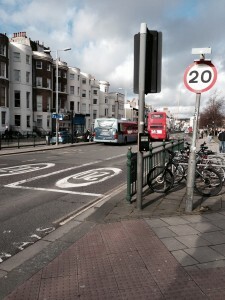 Home » Air Pollution » Is air quality improved by enforcing 20mph zones? Is air quality improved by enforcing 20mph zones? Edinburgh has become the latest city in the UK to announce widespread 20mph zones in order to make the streets safer for pedestrians and cyclists. Following on from the proposals to introduce a 60mph speed limit from a section of the M1 to improve air quality, greater scrutiny is being placed on the reasoning behind new 20mph zones, which are proposed or have recently been introduced in a number of major UK cities including Birmingham, Brighton, Bristol, Cambridge, Edinburgh and Nottingham. Debate has raged in local newspapers and across the web, with strong feelings on both sides. A cursory glance at online comments suggests that this has largely been a dispute of pedestrian safety versus economic convenience (i.e. a new revenue stream for the police from increased opportunity to catch speeding motorists and issue fines). However, awareness of the potential air quality effects of these schemes is comparatively limited. A recent study by the AA suggested that an average petrol car travelling at 20mph consumes approximately 10% more fuel than a car travelling at 30mph due to the effect on the efficiency of the engine, with similar effects observed in air dispersion modelling studies. The NHS estimates that around 19,000 premature deaths per year are caused by air pollution, mostly derived from traffic fumes; around ten times as many deaths as result from road accidents. However, studies to date on the effect of new 20mph zones on air quality have been inconclusive. Although a decrease in traffic speeds is likely to lead to increased emissions on free flowing roads, they may also lead to reduced idling at congestion hotspots. Whilst pedestrian safety is an important issue, greater scientific and public understanding of the air quality implications is badly needed. Input from professional air quality consultants is therefore likely to become more important in the coming years.